By now, after the internet/fanboy hype and fury, everyone knows what a "grindhouse is/was. But, to quickly recap, back in the day (and, remember, the day is very subjective to ones age), they were the rundown, grimy theatres that would show horror/martial arts/sexploitation/C- (or D-) level movies often in marathon form for cheap with crappy sound, missing frames and scratched up prints (from overplaying, abuse) with tons of trailers between features. The movies were generally not very good overall (but did usually feature awesome parts) and cinephiles/best buddies Quentin Tarantino (Kill Bill, Pulp Fiction) and Robert Rodriguez (Once Upon a Time in Mexico, Sin City) have once again teamed up (a trick they pulled before with From Dusk Till Dawn, their not so subtle blueprint for Grindhouse) to pay homage to the halcyon days of their filmic youth. First off, Grindhouse (all three-plus hours of it) is a wildly entertaining visual spectacle crafted with loving reverence by the directors, one that features the same animated "restricted warnings, "feature presentation notices and the scratched up, worn look and feel of its inspirations. But, as filmmaking goes, Grindhouse is wildly inconsistent (yet never boring), especially when you compare Rodriguezs instalment (Planet Terror) to Quentins (Death Proof), or contrast the fictional trailers by the likes of Eli Roth (Hostel), Edgar Wright (Shaun of the Dead) and Rob Zombie (The Devils Rejects). After Rodriguezs trailer for Latino revenge flick Machete (which is apparently going to be made now as a straight-to-video release, although one could argue Rodriguez already made it and called it Desperado), were quickly transported to Rodriguezs Planet Terror, a film thats not so subtly based on any number of zombie apocalypse/horror movies. Here, a secret government gas is released on a small Texas town, turning people into zombie-like mutants and the survivors (led by machinegun-legged ex-go-go dancer Rose McGowan as Cherry and Freddy Rodriguez as the enigmatic El Ray), as usual, have to escape while battling the creatures and a rogue military unit. Rodriguez is undeniably an awesomely talented individual but even his best work has some flaws/issues that keep him from reaching the level of buddy Tarantinos. However, by using the "grindhouse aesthetic and embracing every cliché of the genre imaginable, he builds himself a criticism escape hatch by being more mocking of the genre in a loving, comical way  the dialogue is intentionally bad, the plot holes are gigantic but its okay because its a "grindhouse film  rather than trying to actually do anything new (which Wright, for example, easily accomplished with Shaun). However, Rodriguez casts a number of geek icons (Michael Biehn, Tom Savini, Bruce Willis and, yes, even Tarantino) and goes so over the top with his gore/gross-outs that its hard not to get caught up in the absurd action and disgustingness of it all. After trailers for Zombies Werewolf Women of the S.S. (which sadly is one of the weaker efforts, despite its mega-surprise casting of Nicholas Cage), Roths Thanksgiving (a way extreme 80s slasher tip of the hat) and Wrights Dont (a hilarious send-up of older British horror films), its time for Tarantinos Death Proof, which easily steals the show. 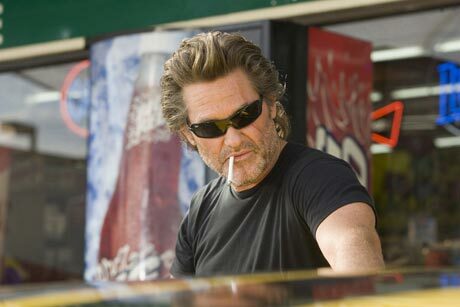 Tarantino has called Death Proof his "slasher flick, only instead of a machete or axe the killer (in this case, a pitch-perfectly cast Kurt Russell as Stuntman Mike, whos equal parts Plisken and Burton) uses a car. Its also obviously influenced by the original Gone in Sixty Seconds, Bullitt and Vanishing Point (which Tarantino also references heavily in his dialogue). But Death Proof isnt just Tarantinos "slasher flick, its also his "female revenge flick (um, again) and his "car chase flick (and the car scenes are excellent, having a very Duel feel). However, while Rodriguez borrows from a number of different directors for Planet Terror, Tarantino is incapable of being anyone but Tarantino, even when paying homage (i.e., Kill Bill and now Death Proof). This means that despite his film being about a demented killer (the aforementioned Russell as Stuntman Mike) that stalks and kills his female victims with his car (and whom eventually picks the wrong women to mess with), he easily transcends the limitations of the premise and of the "grindhouse aesthetic he and Rodriguez set out to embrace. People have criticised Death Proof as being too verbose, too slow, focusing too much on characters that get killed but this is undeniably Quentins style and what makes it more than, say, Planet Terror, as depth is given to the characters (yes, even to the killer) and Tarantinos dialogue, as always, has a way of captivating even when discussing the mundane. His music selection, as well, is again on point, but the discovery here is stuntwoman Zoë Bell, who doubled Lucy Lawless in Xena: Warrior Princess and Uma Thurman in Kill Bill, and who starred in the doc Double Dare. Yes, she does all her own stunts (as does Russell), obviously, but anyone who saw Double Dare knows its impossible not to be smitten with her. As well, she has no trouble delivering Tarantinos dialogue.